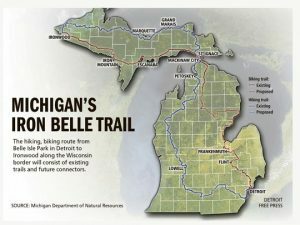 Jump on the longest designated state trail in the nation as you hike or bike your way between Belle Isle Park in Detroit and Ironwood in the Upper Peninsula. Explore pristine forests, pass cool rivers and visit charming towns, and find out why Michigan is known as “The Trails State.” The 1,273-mile hiking route (69 % complete) incorporates a large portion of the existing North Country National Scenic Trail. It traverses the west side of the Lower Peninsula and borders Lake Superior in the Upper Peninsula. The 791-mile bicycle route (64 % complete) utilizes existing multi-use trails and follows US-2, a designated national bicycling route in the Upper Peninsula.